In El Molar, the Priorat region south of Barcelona, Ruud discovered vineyards with perfect sun exposure and rich soil. 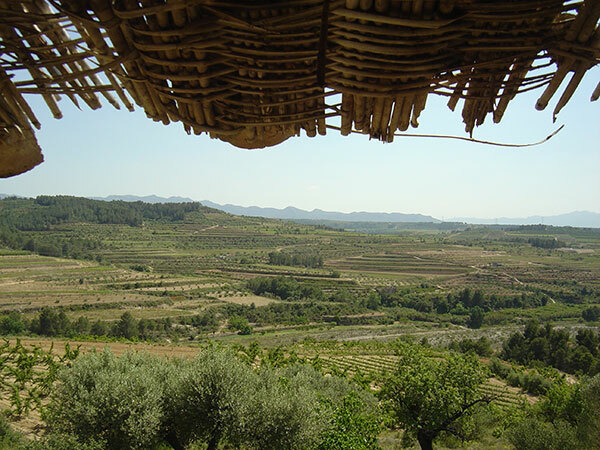 The ‘finca Personas’ of a total of 10 hectares, rolls over the hills next to the Siurana river and valley which includes 50 stone terraces with abundant organic matter. At Mas D’e Panxo on the Solanas estate, the original ceramic underground wine deposits are testament to it’s wine-making history. The estate was used as a hospital during the Spanish civil war. The old vine Grenache and Carignan vines are located on the border of the prestigious DOQ Priorat wine region. The Riera vineyard, bordered by pine trees is planted with Carignan vines and olive trees that assure biodiversity. Ruud also planted Cabernet Sauvignon and Syrah between olives. There is no irrigation and the vines are pruned for low yield to produce the uppermost quality. The Mediterranean sea provides the occasional humid breeze, a warm and stable environment for grapes that grow at up to 200 meters above sea level, under the protection of the venerable Montsant mountain. Since the beginning of time, human activity and the respect for the environment have coexisted harmoniously in the lands of D.O. Montsant. This respect reaches the spiritual realm. Since the 12th Century the Montsant mountain range has been and to a certain extent still is, a refuge for people searching to cultivate spiritual aspects of their lives. The Romans were the first to make wine in these lands, however, it was the Carthusian monks who really developed wine cultivation throughout the region. In the nineteenth century, wines from the lands of Montsant gained awards and recognition in exhibitions all around the world. The countryside and its wine go hand in hand with the D.O. Montsant. It is a land where old vines, painstakingly cared for by their owners, have come to represent History. This History continues evolving, with renewed enthusiasm towards a promising future.